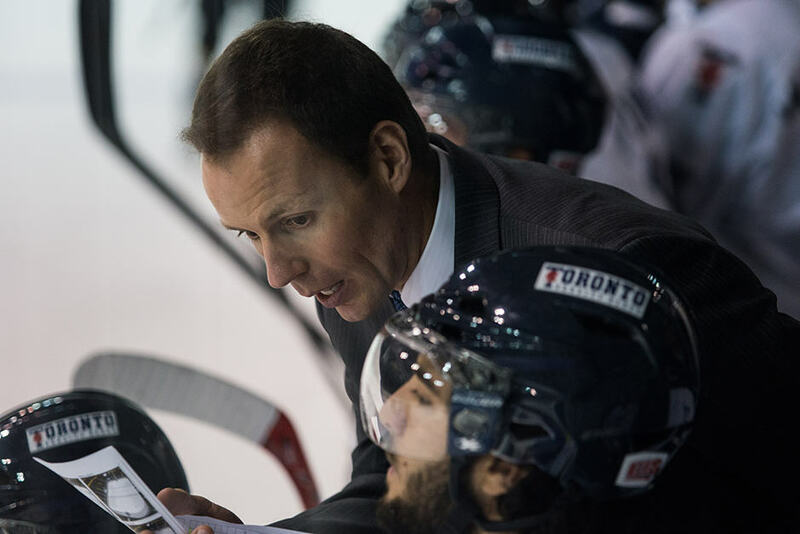 In the years before his hiring as the first full–time assistant men’s hockey coach in Varsity Blues history, Dan Price would look with envy at the Varsity Blue program. “I’d heard rumblings about some of the things it was doing, how the Varsity program had continued to evolve and improve, about the renovations they’d done to the arena. It just seemed to me, like a program that was on the rise,” says Price. While still an assistant to the Tri-City Americans earlier this summer, both Price’s and Blues’ head coach Jim Hiller’s contracts were up. After Hiller left for an assistant job with the Detroit Red Wings, Price knew his career was in limbo. “I remember when I first saw that [job] posting, and thinking this was just another clear indicator of what they were trying to do,” he says. At the interview level, Price was thrilled to find that head coach Darren Lowe and athletic director Beth Ali shared some of his philosophies. Both emphasize the duality of the role of the student-athlete, recognizing the importance in developing their players holistically. In spite of being the first full time assistant coach in Varsity Blue history, Dan Price sees no special expectations for himself. Rather, he sees a generally high expectation for a program as historically great as the Blues. “The expectation certainly is success, every day, every year… definitely the coaches believe it, the players believe it,” says Price. Instead, Price sees himself as an extra resource to the players. Lowe has been essentially running the program by himself for the last 20 years, and Price seeks to alleviate some of that pressure. “There’s so many components… there’s video, there’s off-ice training, on-ice training, there’s player prep, practice prep, game prep, pre-scouting, administrative, budget, recruiting. There’s everything under the sun involved with running the hockey program,” he says. After graduating from the University of Saskatchewan School of Law, Price considered a more conventional career approach. However, the competitiveness of elite–level hockey kept drawing him back. His commitment is evident — while working a different profession in Calgary shortly after graduation, Price began voluntarily scouting for the Regina Pats, a local junior hockey team, on the side. “Most people would rather play if they could. But to the extent that there’s anything that matches playing, or comes very, very close to playing, for me anyway, it’s coaching, and a big reason for that is because of the strategic and planning component,” says Price. The team is struggling in its play so far this season, but recent improvements and successes have indicated hope for the team’s playoff run, and Price will help to lead the Blues to this goal.